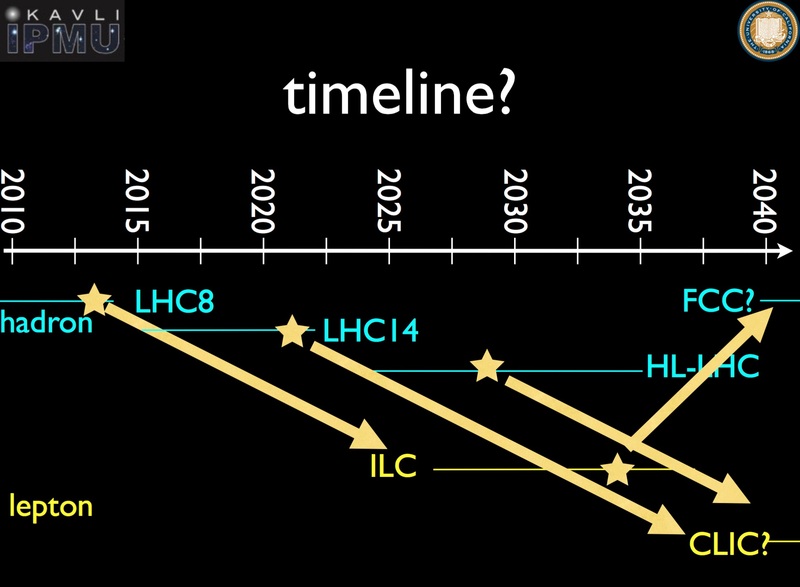 The timeline for future colliders? In Whistler, British Columbia, some two hundred physicists gathered to the annual Linear Collider Workshop. As the last speaker of the meeting, I tried to summarise the status of various collider options currently under discussion. In particular, I tried to clarify their readiness and timelines. The ILC passed the TDR (Technical Design Report) stage back in June 2013 and is considered technically ready to be built. CLIC achieved its CDR (Conceptual Design Report) in October 2012, which needs to proceed to TDR to be considered ready. The electron-positron option of the Future Circular Collider study (FCCee) is being looked at as a stopgap option if the proton-proton option (FCCpp) is going to be built, and is slated to complete its CDR by 2018 to be ready for discussions at the next European Strategy update. However magnet R&D needed for FCCpp won’t be finished before 2021. The Chinese electron-positron collider (CEPC) has finished a pre-CDR, and is proposed for R&D funding in the next five years. We hope to know whether the R&D budget is in the next five-year plan of the Chinese government sometime early 2016. If it goes through this time with successful R&D, construction of CEPC will be proposed in the Chinese five-year plan in 2021. The Chinese super proton-proton collider (SPPC) requires the same (or better) magnets as FCCpp. The Muon collider has made a big progress in simulation of muon cooling, but technical demonstration is still needed. From the physics point of view, it is always wonderful to aim at as highest energies as possible for exploration at the energy frontier. There is mounting enthusiasm behind a 100-TeV pp collider for this obvious reason. 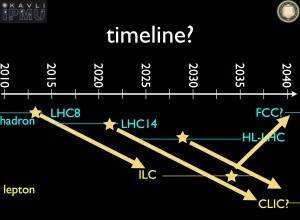 FCC proposes a timeline to start physics in 2035 right after the high-luminosity LHC upgrade HL-LHC finishes, which assumes FCC can be built in a shorter time than LHC. Realistically, the earliest time I can imagine for FCC would be sometime around 2040, with a gap in CERN physics programme. I argued there is a simple and clear physics case for ILC, now that the Higgs boson is discovered. It is the only (apparently) elementary spinless particle, a spooky faceless object. I couldn’t believe such a particle would exist, which we have never seen before, and published “Higgsless theories” with collaborators. Now that it is discovered, I’ve been apologising at international meetings in the past three years, pretending that I’m properly Japanese! Yet the uncomfortable feeling remains. Why is there only one spinless particle in Nature? We introduced it to the Standard Model for its most important job. The theory seems so artificial. Perhaps it has siblings and relatives? This idea is called supersymmetry. Or it is actually secretly spinning in extra dimensions we don’t see? Maybe it was wrong to assume it is an elementary particle after all. All of these possibilities can in principle by precision measurements of its properties. Actually, Nature gave us a big present: the Higgs mass of 125 GeV is such that we will have access to a large number of its decay modes, bb, cc, ττ, gg, ZZ*, WW*, γγ, and possibly invisible. She is hanging bait in front of our faces, and it would be stupid not to take it. Electron-positron colliders would be uniquely suited for precision measurements of all of these modes (including the capability to separate cc and gg) in a model-independent fashion. This is a very clear reason why we would like to study this newly discovered particle at an e+e– collider. To me, proposals for circular e+e– colliders seem limiting. CEPC does not reach the ttbar threshold. FCCee can’t access top Yukawa coupling, a crucial element in electroweak symmetry breaking. It is very difficult to achieve longitudinal beam polarisation without a big hit in luminosity. The beam polarization would prove extremely beneficial if we find new particles to measure its quantum numbers. It can be frustrating to see that political process for the ILC takes time. When it does take time, there are obvious things we should be working on. Improve superconducting cavities for potential higher gradient and cost saving, demonstrate high yields at X-FEL and LCLS-II, achieve even better emittance at KEK-ATF. And most importantly, stick firm to the clear and obvious physics case. Especially when it takes time, we should dream big. FCCee and CEPC have gained momentum because of the dream of a bigger pp machine once the circular tunnel is built. In the same way, once we build a linear tunnel for ILC, we can dream about putting CLIC going up to 3 TeV, and in the long run, a plasma accelerator to go up to 30 TeV. Who knows, it will be forty years before we get to that stage. Our field thrives on dreaming big. And there are no shortages of dreams. Stay firm.